Move over, Singapore – South Africa is here! Breathtaking vistas, scenic golf courses, tricky putts and challenging links; a beer at the 18th, some sweat, some bonding, some downtime with buddies. Followed by a safari. Tawny mane, amber eyes glowing – is that really a huge male lion walking a few metres from your open air safari vehicle? Good food, good cheer, some good single-malt by the campfire under a star-filled sky. This golf safari is made for you! This safari was designed especially for all you hard-core golfers who think that a few days of golf combined with a few days of tracking the Big 5 in the African bush is the ultimate vacation experience! It includes a laid-back exploration of Cape Town, a substantial taste of some of the premier golf courses in the country and tops it all off with a few days at one of the most exclusive luxury safari destinations of South Africa. At the Steenberg Hotel, you will have access not only to a world-renowned working winery, but also to its cunning 18-hole, championship golf course and the Clovelly Golf Course. From there, it is on to the Fancourt Hotel & Country Club Estate. 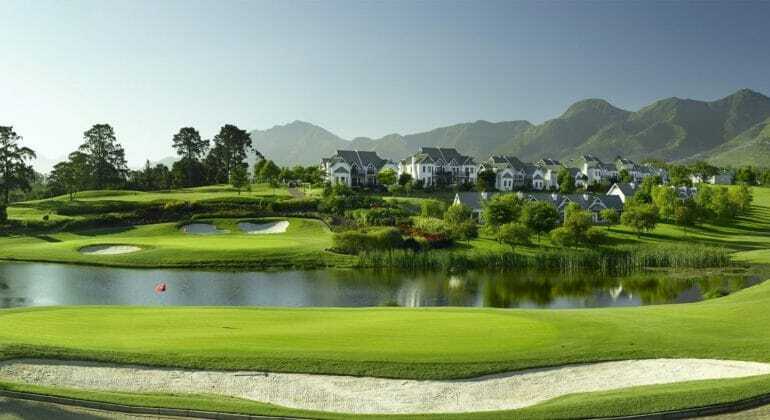 Fancourt’s Outeniqua, Links and Montagu golf courses have matured and developed into the finest 18-hole parkland layouts in the country. A round on any of these is a special experience. The safari closes off with an exciting finish at Londolozi Tree Camp in the Sabi Sand Game Reserve, renowned for having the best Big Five game-viewing in South Africa! Located on the south-western corner of the Kruger National Park, there are no restricting fences, thus enabling the animals to roam freely just as nature intended. This tour begins in Cape Town and ends in Johannesburg.